My Lawyer Told Me to Refuse the Chemical Test in New York, Is that Right? | Raw Law | Law Offices of Adam M. Thompson, P.C. For the average motorist the sight of flashing lights in the rear view mirror is not a welcome sight. If you have been drinking before you got behind the wheel those flashing lights take on a heightened importance. Although most people don't plan to go out and drink and drive, people do often consider what they would do if stopped for drinking and driving. As such, we are often confronted with the following question: " My lawyer told me to refuse the chemical test in New York, is that right? " The truth is that there is no easy answer to that question; however, a better understanding of New York's refusal laws and penalties may help you answer it for yourself. Like most states, the State of New York has an implied consent law. 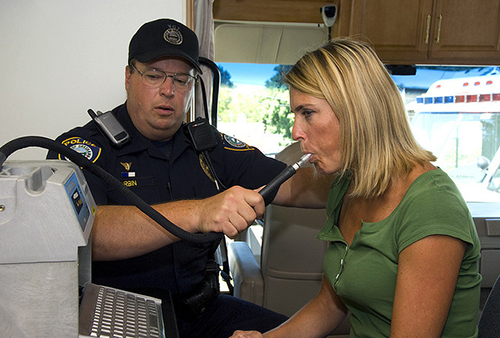 The implied consent law essentially states that you, as a motorist, give your implied consent to submit to a chemical test if you are lawfully arrested by an officer who has probable cause to believe that you have been driving while intoxicated. Despite the fact that the laws says you have given your consent to a chemical test you are still able to refuse the test under most circumstances. Refusing, however, comes with its own set of potential penalties and consequences. Refusing a chemical test in the State of New York will cause your driving privileges to be suspended for one year for the first refusal. A subsequent refusal will result in an 18 month suspension of your driving privileges. In addition, the fact that you refused to submit to a chemical test can be introduced at trial by the prosecutor and used as evidence of your guilt. For most people, whether or not to submit to the chemical test comes down to an evaluation of the potential penalties faced for a conviction versus the penalties for a refusal. For example, a second DWI conviction within ten years in New York carries with it a potential punishment of up to four years in prison. Refusing the chemical test does not guarantee you will not be convicted; however, it does eliminate the possibility of using a high BAC test result to obtain a conviction. Therefore, you might decide that the 18 month license suspension is preferable to facing four years in prison. For additional information or to discuss your pending DWI charges contact an experienced New York criminal defense attorney right away.